FlexibleStart Treatment for a low down payment. "Our whole goal here is to make the financial aspect of orthodontics as flexible and as comfortable as possible. Flexibility is the key to breaking through that financial barrier." Most of our patients choose to finance their treatment and we have dedicated staff to develop a financing plan that works for you. We offer payment plans spread over months, or even the entire treatment time. If you pay in full, you can receive a cash (5%) or credit card (3%) discount on your total. Do you charge extra for retainers? No, all your fees include any retainers we recommend and provide for you. All fees cover follow-up visits for the first year, too. There is a small fee charged for all lost or broken retainers. Due to material costs there’s a small increased fee. We believe in offering the best system possible to give you an amazing smile in the quickest time frame. Does my dental insurance covers braces? 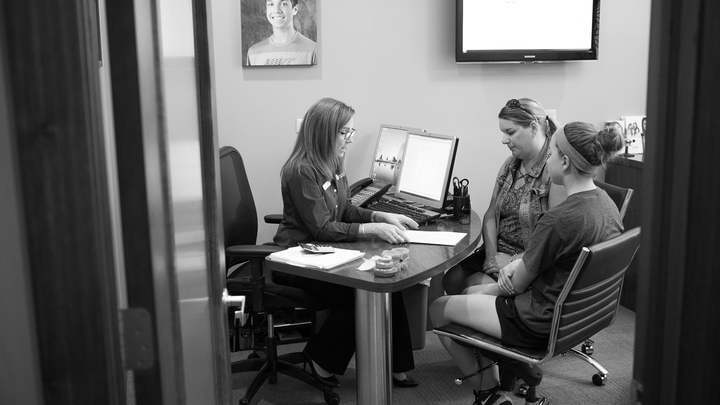 Once you provide your insurance information, we will gather all of the information about your orthodontic coverage available to you when you come to our office for your first consultation. Yes, under our comprehensive treatment fees, you benefit from free retainer checks for the first year. But honestly we are very flexible. We want you to have access to us for amazing continuing care and any questions you may have after treatment. No! The cost of Invisalign is almost always comparable to that of braces – and sometimes even less! Can I use my Flexible Spending Account ? We are here to answer any questions you may have. We know figuring out how to finance orthodontic treatment is personal and unique to every family’s situation, so we want to be as clear and as transparent as possible about what options you do have. Our goal is to reduce the anxiety people feel when it comes to financing any sort of medical cost. Every family who comes into our office has different financial situations. We want to make sure we can make orthodontics affordable for everyone. Flexibility is the key to breaking through those financial barriers.